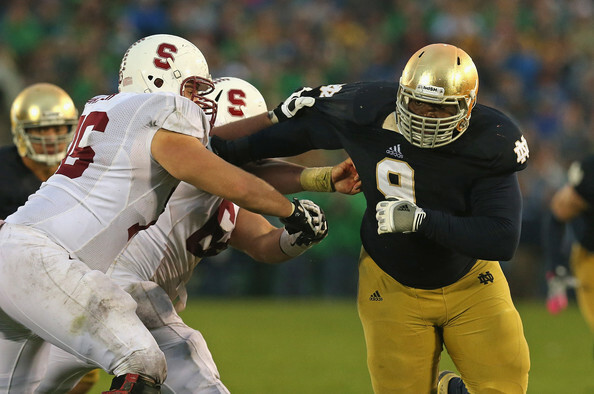 Louis Nix III is a massive 3-4 nose tackle that anchors the Fighting Irish defense. He is a force in the middle of the defense and he ties up everything in the middle of the line. On passing downs, he does a decent job at pushing the pocket and getting his hands up to affect passing lanes. Nix has a good swim move and he sheds blockers very quickly. He has surprising agility and has the lateral movement to pursue plays down the line of scrimmage. Nix led all Notre Dame defensive linemen in 2012 with 50 tackles and ranked 4th on the team with 7.5 tackles for loss and 2 sacks. He also had 5 batted balls. In the spring game, he even lined up in the shotgun on offense and ran for a two point conversion. Nix reminds me of Vince Wilfork of the Patriots and should he declare for the draft, he should be the top defensive tackle taken. He could be successful in a 4-3 scheme, but he is a prototypical 3-4 nose tackle. Timmy Jernigan is an example of a good 4-3 defensive tackle, or 3 technique as they are called. He is explosive off the ball and is a disruptive force in the opponents’ backfields. In the last two seasons, he has 76 tackles, 14 tackles for loss and 4 sacks while playing part time. 2013 will be Jernigan’s year to step into the starting lineup and I believe he will make a big impact. Jernigan is surprisingly light on his feet and he has the ability to chase plays parallel to the line of scrimmage. For a disruptive player, he needs some work on his quickness getting off the snap. He does however use his hands well and has the footwork to shed blockers and shoot gaps. Jernigan still has some learning to do technique-wise and could probably use another year at the college level, but he has tremendous upside and if he declares for the draft, NFL scouts will be really interested in him. Anthony Johnson was overshadowed last season by the likes of Bennie Logan, Sam Montgomery and Barkevious Mingo. This year Johnson will be the most experienced player on the Tigers’ defensive front and he will be looked upon as a leader. Johnson is a physical player with good speed for a 295 pounder. He has lost 40 pounds since his freshman season and it has made him quicker and more nimble. At times he was the first Tiger off the ball last year and that line included Mingo and Montgomery who were very quick and athletic. He has the burst to quickly slip through gaps and cause disruption in the backfield. Johnson is still raw and needs some work on his pass rushing technique. He doesn’t always play with the proper pad level, but NFL scouts will love his combination of power and athleticism. Daniel McCullers is a massive nose tackle. He is 6’8” and was over 370 pounds when he arrived at Tennessee. Reports are that he has lost weight into the 350 range. Despite his weight, he carries it well and he uses his strength and size to his advantage. He would be a good fit for a 3-4 nose tackle. McCullers was a JC transfer and started slow last year, but he averaged over 4 tackles per game in his last 8 games and had two games with more than 8 tackles. He has surprising athletic ability and a good motor. Against Florida, he chased quarterback Jeff Driskel 20 yards down-field and made a diving tackle from behind. McCullers regularly gets double-teamed and he has the ability to make plays despite being double-teamed. His size also makes him a threat to block kicks. At 6’5″ and 315 pounds, Deandre Coleman has the size you want for a nose tackle. Coleman played as a 3-4 nose tackle last year, but Cal will be changing to a 4-3 scheme this year. Coleman has only started 13 games in his career, but he led Cal defensive linemen with 48 tackles last year and he had 8.5 tackles for loss. The Cal defense has called for him to tie up blockers and let the linebackers make plays, but Coleman has still made his fair share of plays. Coleman is tough to move at the point of attack, however, he sometimes plays a bit too high. He has decent quickness off the ball for someone his size and he uses his long arms to shed blockers. Coleman should flourish in the new 4-3 scheme. His versatility to play in both the 3-4 and the 4-3 should improve his draft position. This entry was posted on August 24, 2013 by draftmaniacs in Top 5 at each position and tagged 2014 NFL draft, Anthony Johnson, Cal football, Daniel McCullers, Deandre Coleman, Fighting Irish football, Florida State football, Louis Nix III, LSU football, NFL Draft, Notre Dame football, Seminole football, Tennessee football, Timmy Jernigan, Volunteer football.